Our poly coated brown Kraft Paper is the king of the hill. This heavyweight brown Kraft paper sheet has a poly coated side that provides it with the most “wet strength” possible. It is great for wrapping greasy sandwiches, meats, seafood, dairy products and more. Look no further if you’re wondering where to buy Kraft paper, this brown wrapping paper is the right choice. Coated Kraft brown paper is great for high end food presentation too. This custom printed food service sheet shows your customers you know how to take food presentation to a whole new level! 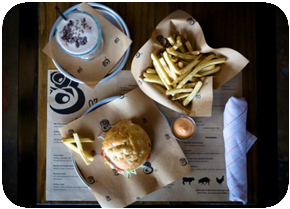 In the world of custom printed food service papers, Coated Kraft Paper is KING! Simple, our minimum order requirement for custom printed Coated Kraft Paper is 3 cases = 3,000 sheets, OR 5 kraft paper rolls = 3,000 feet (600 feet per roll). Our ability to deliver short run orders will reduce your storage space needs and allow you to better control your product inventory. Because they are slow and inefficient! Our goal is to get your printed order delivered as quickly as possible. We work tirelessly to make sure our customer deadlines are met. The quality of our product will keep you coming back for more. If you need your order in a hurry, ask one of our sales team members about our Rush Order program. No! While we do offer a list of standard sheet sizes to help keep your overall project costs down, we can also custom cut your sheet size to any desired width and length needed to fit your application. We are currently limited to 2 spot PMS colors on all our short run food service sheets. Sometimes, we can add 1 or 2 screens to your print if the colors in your logo allow us to use them. Three & four color prints are available for most of our food service paper line, but minimum order size and print capabilities vary. Contact our sales staff for more information. 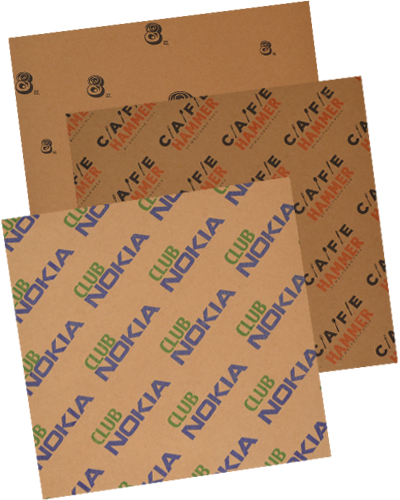 Need a price quote on custom printed Coated Kraft Paper? Contact us today! Need a printed food service sheet that can protect food in the freezer for up to one year? Then look no further than our custom printed Freezer Paper. This coated heavyweight sheet will exceed even the toughest critics expectations.